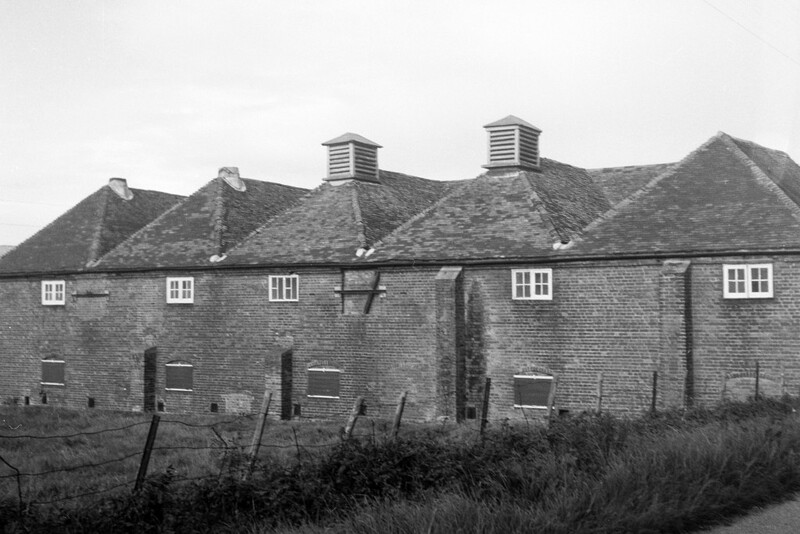 Barn style oasts, without conical kilns, but often expanded into a T shape to accommodate two or more kilns at one end, or in a row at the side of the stowage, continued into the 18th Century. 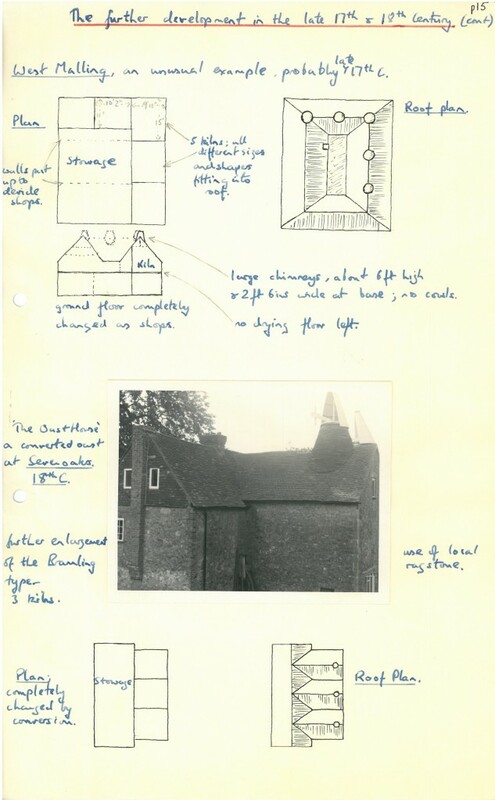 It is striking that Richard Bradley in Riches of the Hop Garden Explained, describes and illustrates the ground plan of a kiln almost identical to Scott’s from 150 years earlier. “in some places they build houses or sheds at the corner of the hop garden, divided into three chambers“. Malt kilns can serve quite well so long s charcoal is used. 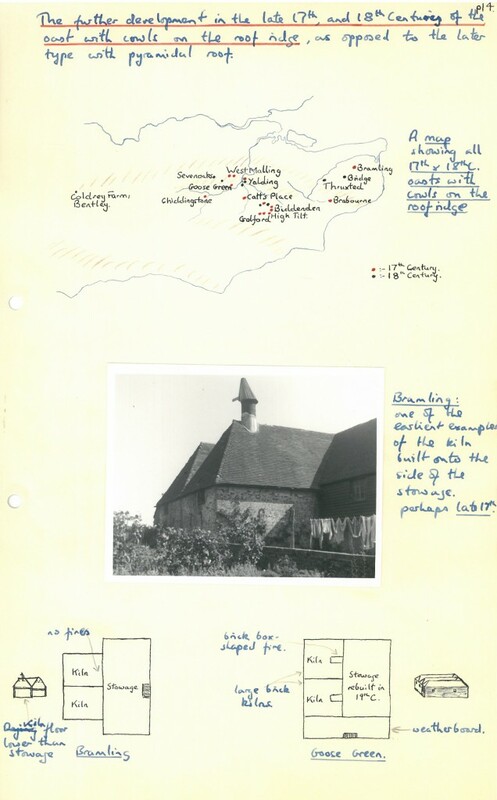 He adds that there is no need to describe the building in any great detail as anyone can see examples of it around Faversham and Canterbury, suggesting that new designs of kiln had yet to appear. Perhaps as a Professor of Botany he was not very interested in the drying. The format of a barn style oast with a row of kilns along one side of the stowage is developed by The Dublin Society book. It suggests 3-4 kilns 8-10 foot square ranged along the back wall of the building. If the building is 28 feet long and 15 feet wide, then a passage of about 5 feet can run along in the front of the kilns. The kiln walls should be 9 ins think of brick, and 7 feet high in front. The drying floor should be about 6 feet off the ground with a foot of wall above the drying floor to keep the hops in. The bigger the kiln the higher the drying floor to distribute the heat e.g. if the kiln 12 feet square then floor should be 9 feet up. But there is still no guidance on building the sides of the kiln up to a vent in the roof. 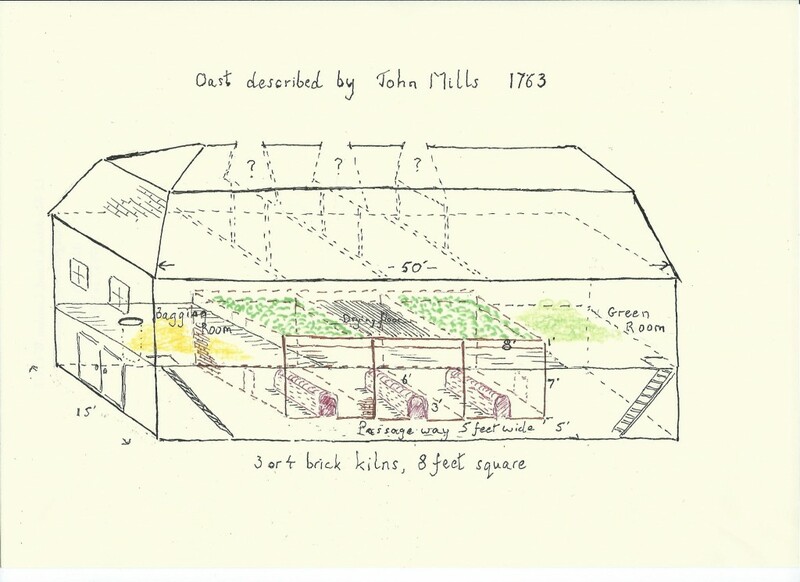 A more detailed description of a similar but larger model oast is given by John Mills in his 1763 book A Complete System of Husbandry (18th C writers did not exercise much imagination about the titles of their books). The diagram below shows what he recommends. The 50 x 15 foot building contains 3 kilns, but he adds that a larger building with 4 kilns could be built if the scale of operations warrants this. Apart from the suggestion of plastering the upper walls to reflect heat on the drying hops Mills gives no description of anything above the level of the drying floor. Given the detail on the lower levels it is puzzling that we do not know whether an inverted cone was built to draw the smoke, moister and reek up to a vent. Precise measurements are given for the furnaces, also known as a steddle or lanthorne. It is built of brick with gaps all along the side and end to radiate heat through the kiln. The drying floor is made of 1 inch square wooden rails with a hair laid on top of them and hops laid 6 inches deep. A 1745 instruction to build an oast at Sutton Valemce for Sir Edward Fulmer contains a ground plan and side elevation also very similar to the Scott model. 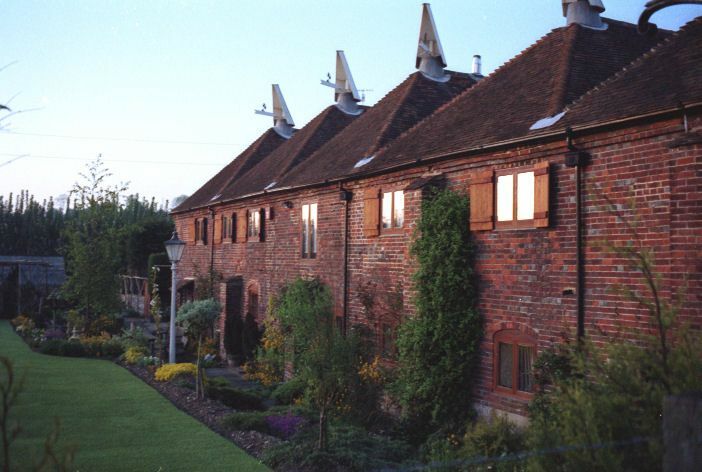 Some surviving examples of barn style kilns are at Sauls Hill, Cranbrook, Bramling between Canterbury and Sandwich, Goose Green NE of Tonbridge and West Malling, all in Kent. Most of these are larger than their 17th Century predecessors. Even in this conventional style kilns were gaining increased capacity, for example the 3 kiln example in Sevenoaks ( and, most strikingly a 5 kiln oast at Thruxted near Chartham, south of Canterbury . None of these oasts was still in use in 1960. Bramling, east of Canterbury. 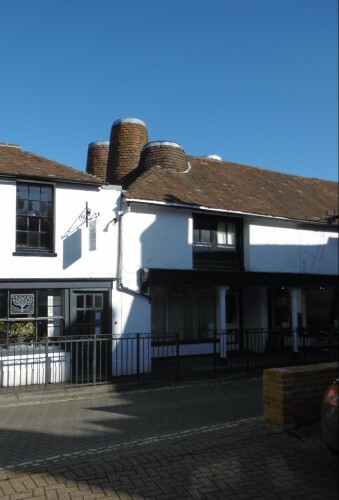 The building still stands in much the same form but without cowl, so without external identification as a former oast. Kilns in West Street, West Malling, probably inserted into an existing building for drying malt and/or hops. Now a shop,and housing. See ground plan in previous diagram. An example of forerunners of the 19th Century roundals breaking though the conventional roof.